January is notoriously a quiet month for gigs especially as dates from touring artists don’t normally kick in until the latter days of it. However there is no better way to fill this void than to seek out a local act who are striving to raise their profile amongst the plethora of bands plying their trade on the pub circuit. 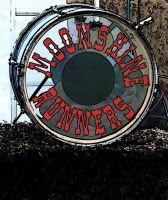 So it’s with great delight to introduce the Shropshire based quartet Moonshine Runners and to kick off this third year of live reviews with a band who, through a combination of inventive covers and excellent originals, harness a sound that perfectly fits their catchphrase of ‘from hoedown to harmony’. In essence the band extracts their influence from a cocktail of primarily Americana sources tipping their hat along the way to the fine purveyors of both country and folk rock, all laced with a drizzle of authentic roots. Their highly entertaining and exhilarating live show is a melange of democratic instrumental and vocal interchangeability. Leads getting tangled up may be a band in-joke but the richness emanating from banjo, bass, mandolin, lap steel and various types of acoustic guitar adds a significant flavour to their choice of songs. The band introduced three originals into their comprehensive pair of sets at The Brewhouse music annexe at Dudley’s Lamp Tavern pub. Two of them evolved from the pen of Graham Clews who is the band’s prime multi-instrumentalist. ‘Where You Gonna Run’ is a delightful vocal exchange of softly driven country rock showcasing the band’s capacity to harmonise exquisitely amidst a sweet aroma of gentle acoustic strumming and atmospheric lap steel. This song has the potential to turn a lot of heads on the UK Americana circuit. Graham’s other contribution was a sea shanty style folk number ‘Will You Go’ which came over really well, while the third original composed by Tim Barratt ‘Living My Dream’ had a positive vibe to encourage its surfacing into the wider world. Tim also delivered an engaging, entertaining and enthralling version of a twisted tale titled ‘I am my own Grandpa’. 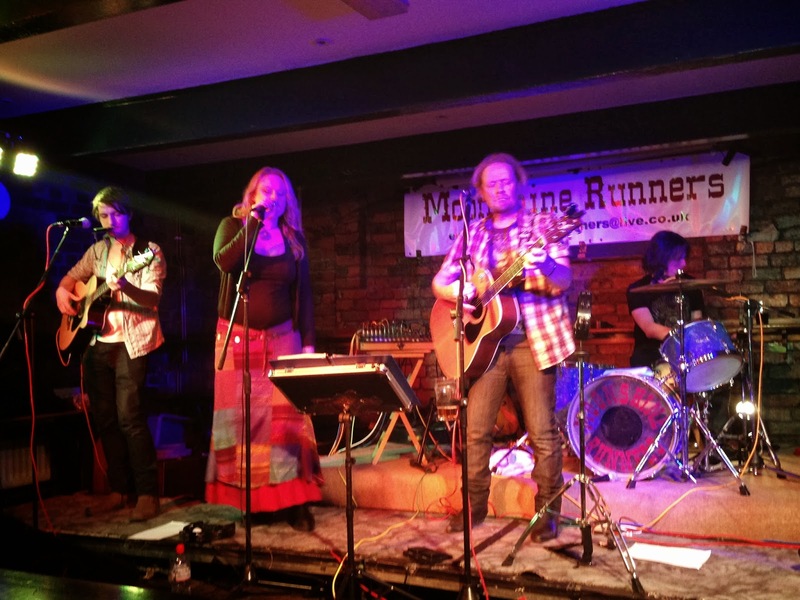 In addition to Graham (mandolin, bass, drums, lap steel, guitar, vocals) and Tim (guitar, vocals), Moonshine Runners are completed by Rob Cooper (banjo, bass, guitar,vocals) and Chrissii Wing (lead vocals, bass). However this is far from a compartmentalised band as exemplified by the instrument exchange and each member contributing unique valuable lead vocal segments. This was particularly highlighted in their top notch version of The Band’s ‘The Weight’ where the verses were equally distributed, chorus harmonised and Graham living his Levon Helm moment. The band’s approach to covers is to take a mix of pop standards and more specialist material then put their own stamp on them with a roots orientated twist. ‘Weather with You’ had some lap steel treatment while mandolin freshened up ‘Norwegian Wood’. ‘Swept Away’ by The Avett Brothers, Poco’s ‘Rose of Cimarron’, Faith Hill’s ‘Mississippi Girl’ and ‘Watermelon Crawl’ originally recorded by Tracy Byrd are not your normal Friday night pub covers but the Moonshine Runners expertly interpret them to ensure eyebrows are raised. They acknowledged the populist angle of their chosen music style with a version of ‘Hey Ho’ and the Bob Dylan/Old Crow Medicine Show/Darius Rucker, fast becoming a standard, ‘Wagon Wheel’ is a sure fire winning addition to any set. They make no secret to their admiration of Fleetwood Mac in both influence and style. Chrissii excels on their version of ‘Landslide’ while Tim rises to the challenge of the guitar solo on ‘The Chain’. The acoustic touch to all their choices reveals a layer of authenticity and allows the innate talent to flourish. The sparkling finale focussed on the sparring of Tim and Rob during the band’s rendition of ‘Duelling Banjos’ and would have been a fitting finale itself had not a request for ‘Sweet Home Alabama’ been politely fulfilled. Obviously a greater focus on original material will lead to different levels of interest and scrutiny in the Moonshine Runners, and there is definite potential in this path, but whichever song balance the band decide to proceed with, their ability to produce a damn good show is locked in. So check them out either on the Midlands gig circuit or hopefully in a wider available recorded format.